Barack Obama surprised observers yesterday by electing to get Congressional approval for Syria. He also appeared to go out of his way to assure the American people that this would not be an open ended military involvement. The climbdown was clearly in response to the growing opposition to war in yet another Middle East quagmire, punctuated by the shocking rebuff to British Prime Minister David Cameron by the House of Commons this week. Fans of constitutional governance should rejoice. The decision also forces Congress to declare where they stand on the issue, instead of waiting to see what they could criticize the President for. Of cours fans of the imperial Presidency are not delighted at the decision. Warmongerers are unhappy that Obama is not going all in on regime change – still no suggestions from them on what the new regime would look like. Senator Grumpy lashed out at the thought of the limited war. His war loving amigo Senator Lumpy agreed. Former Senator (and still war loving mega douche) Droopy was horrified that the President thought he had to go to Congress before bombing someone in the Middle East. Left unsaid in all of this is what happens if the initial bombing does not change Assad’s behavior (which is likely). What happens then? Barack Obama backed himself into this conflict by drawing his imaginary red lines. He has wisely toned down the rhetoric after gauging the opposition, but this was a stupid red line that should never have been drawn. Once again I cannot help but wonder what happens when these lines are crossed by the other Middle East country Grumpy, Lumpy and Droopy want to bomb – Iran. The last few years have seen a more muscular French foreign policy with interventions in its former colonies Ivory Coast and Mali. France was also the loudest proponent of taking down Gaddafi (probably to overcompensate for its support of the Tunisian dictator and Pharaoh Mubarak at the start of the Arab Spring). Of course having advocated war in Libya, France (and Britain) ran out of missiles when faced only with Gaddafi’s puny military. Meanwhile in Britain recriminations abound. Having miscalculated the level of opposition to the war Cameron’s toadies are attacking Labour for endangering the special subservient relationship. However, for now little has changed. Even without Britain, Barack Obama’s rush to a half baked war continues. Looks like the Gallic Rooster will join the American Rooster in its Syrian war. So much for the special relationship..it cannot work when Britain does not recognize its role as lapdog. In the United States President George W. Bush Barack Obama remained unbowed and indicated that the United States was ready to act alone. Our Congress only wants to be consulted but does not want the responsibility of authorizing the war. The British parliament has learned the lessons of Iraq. Our Washington bubble has not, even though the proposed intervention is extremely unpopular. So, for now the administration is unlikely to suffer the humiliation of David Cameron. Fareed Zakaria dumbly and stubbornly supported the Iraq war but in the video below cogently sets forth the quagmire and bloodbath facing us (whether or not we interfere). The do-gooders are united in the need to send Assad a message. Yet apart from a belief in magically identifying in the good guys of the opposition, none of them has identified what the end game is and how we prevent an ethnic bloodbath and install a stable government in Syria. The mistaken urge to maintain credibility is driving us to a war in Syria…and it will do so again in Iran. With Secretary Kerry’s speech Monday American military intervention into the Syrian quagmire seems inevitable. Last year Barack Obama allowed himself to be backed into a corner by saying that the use of chemical weapons by the Syrian government constituted a red line. Last week that line appeared to be crossed as horrific images of casualties from a nerve gas attack near Damascus emerged. So like Libya, a human rights calamity is driving the United States to war. The Syrian government and their Russian patron have of course denied that they used chemical weapons. With the military balance slowly tilting in its favor the use of chemical weapons at this juncture is puzzling. However the United States enters into a quagmire that it will be hard to extricate itself from. Stupid comparisons to the Kosovo intervention have started. The virtues of air power are once again being touted. Yet in Kosovo the Yugoslav government only capitulated when the exasperated American government intimated that boots on the ground were on their way. Here boots on the ground have been ruled out. After the example of Libya the Russians are adamantly against any regime change. American airstrikes by themselves are unlikely to solve this conflict. Unlike Gaddafi, the Baath regime is backed by communities like the Alawites who have every reason to fear a massacre. The Syrian opposition itself is now dominated by radical jihadists so the merits of them replacing the brutal Baathist regime can be debated. But after a year, the warmongerers have their wish. America is about to militarily intervene in an ethnic conflict where it has absolutely no idea as to the end result it wants or can achieve. The suffering of the Syrian people is appalling. However, the explanations as to why an exhausted America must be the gendarme of the world are not compelling. It does not bode well for the prospects of war with another country in the region where Barack Obama against his better judgment was compelled by the outcry from the media, the right-wing and the Israeli government to draw a line in the sand – Iran. The news from Syria has been uniformly awful. While this blog is still firmly opposed to American military involvement in a civil war likely to end in an ethnic bloodbath, it still hopes for a solution that stops the human suffering and displacement. 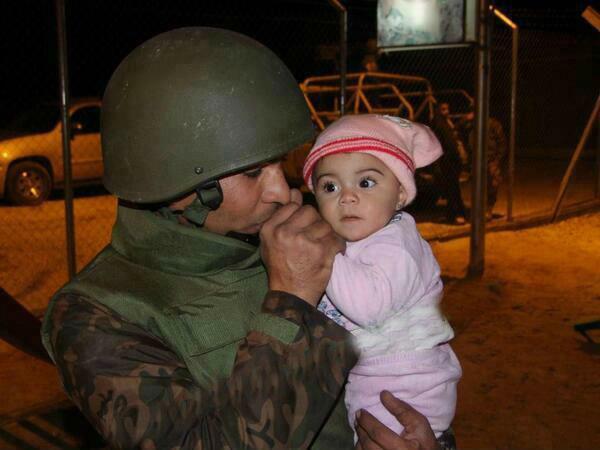 The photo below was posted on Reditt and Facebook over the weekend and shows a Jordanian soldier warming up the hands of Syrian refugee baby after making it to the border safely. Yes, I am a sucker for cute baby pictures. Syria was always the most dangerous tinderbox to catch fire in the Arab spring. While it is not important in oil geopolitics, it occupies a strategic location between Turkey, Iraq and Israel. Its population is two-thirds that of Iraq and its ethnic quilt far more patchy. Like Iraq under Saddam Hussein it is ruled by a brutal Baathist regime of a faith different than the vast majority of its people. The fact that Baathists arose in the socialist and nationalist currents of the 1960s means that the non-Sunni groups like the Christians have been fairly ambivalent in wanting to replace the Alawite regime. To make things worse, Syria is a proxy between the Sunni Gulf monarchies and Shiite Iran (the biggest sponsor of the Assads). As previously noted here, the Assad regime is brutal but the Saudis have no business lecturing anybody on human rights – particularly after helping the Sunni Al-Khalifas supress their restive Shiite majority in Bahrain. If this was not complicated enough, the Russians have proved extremely resistant to letting their last former client state in the region fall. The expansion of the Libyan intervention from saving Benghazi to toppling (and ultimately lynching Gaddaffi) probably means that Russia will stand firm. And the fighting is getting worse as Syria’s largest city is now the front-lines of what is essentially a civil war. The problem is that the opposition to the Assads is and incoherent hodge podge and there is no clarity on what follows the fall of the regime and how much autonomy to give groups like the Kurds. Like Iraq, Syria was more of an abstract concept before its creation (like Yugoslavia and Iraq) in the aftermath of World War I by carving up the Ottoman Vilayets of Damascus, Beirut and Aleppo – the residues ending up in Jordan, Lebanon, Israel and Turkey. Like Iraq this state was notoriously unstable until the Assads came to power. And they have absolutely no incentive to leave. Likewise the Alawites can probably expect a bloodbath when the Assads fall – so they have no incentive to stop supporting the Assads either. Syria’s Christians have probably taken a look at the fate of their brethren in Iraq and the worries of the Copts in post-Mubarak Egypt. Until they can be convinced the fundamentalist element will be kept at bay, they will likely at best remain ambivalent too. I have to wonder what Israel thinks about the fall of the Assads. There is no love lost there, but would they prefer the devil they know versus the devil they don’t? It is striking that the West is calling for Assad to leave but there has been precious little public debate on what happens next. What have they learned from the Iraq fiasco that they will use to prevent a cycle of violence and ethnic cleansing? And who will intervene? The EU’s minister in charge of pontificating on foreign policy, Baroness Ashton has made all the necessary pronouncements about organizing the opposition blah blah blah. There still seems to be nothing on the ground. There seems precious little appetite among the loudest critics of the Assads (other then war mongerers like John McCain) to bell the Assad cat. The Libyan or Northern Alliance solution leaves the risk of an ethnic bloodbath at the finish. Yet preventing the opposition from arming would repeat the tragedy of Bosnia – where the Muslims fought with one are tied behind their back and the Serbs were funded by Yugoslavia/Serbia. So the tragic civil war continues, as the world ponders the dilemma posed by yet another flawed offspring of Versailles. The Arab Spring toppled long standing autocrats in Tunisia, Libya, Egypt and Yemen. For a while it looked like the al-Khalifas of Bahrain would ease the suppression of their Shiite majority (this blogger was among those caught up in premature excitement), but that hope has been crushed with Saudi military intervention. Meanwhile, Bashar al-Assad is showing he is a chip off the old block by responding to protests with a iron fist. The bloodbath in Syria has erased any illusions that Bashar al-Assad could be a reformer (and made laughably timed puff pieces like this one about his wife Asma even more ridiculous). The Alawite regime is and has always been a brutal military dictatorship. It has hosted assorted anti-Israel terrorist groups, held Lebanon in vassalage for almost two decades and is Iran’s only remaining friend in the Arab world. The massacre last week in Houla has brought renewed calls from a motley bunch for military intervention. And this is truly a motley bunch. You have bellicose American Senators like John McCain (who 4 years ago seemed willing to get into a shooting war with Russia in support of an autocratic and bellicose Georgian regime). You get neo-cons tossing out laughable justifications. You have human rights do-gooders who insist that the world cannot stand idly by. And then you have Saudi Arabia (fresh off suppressing the Shiite protests in Bahrain) bleating cries of human rights. Of these, the Saudis are the most cynical. Syria is one of the few (other than Iraq and Yemen) Shiite Arab regimes. When you factor in the Iranian alliance of the Alawite regime and that many of the protestors in Syria are Sunni, the Saudi human rights concerns appear primarily sectarian. The Libyan intervention should also not serve as a template for a military intervention by the United States in Syria. The Syrian army is far more equipped, Syrian society is far more diverse and stratified and the military commitment will approach what was needed in Iraq. In fact, it is fascinating to see how quickly people have forgotten the lessons of Iraq. The fall of Saddam was followed by the ethnic cleansing of the Sunni population out of parts of Baghdad and the dispersal of the Christian minority in Iraq into forced exile. The Syrian ethnic quilt is far more confusing than Iraq in ethnicity and religion. One notable characteristic of the Arab Spring has been the reluctance of religious minorities to trust their fate to popular democracy. The regimes in Egypt and Syria (or even Saddam’s Iraq) were not beacons of religious tolerance but they were/are markedly more secular than their successors or likely successors. The opposition to the Assads has often had a heavy Sunni Islamist tinge and the Christian, Alawite and other minorities appear to have been largely lukewarm to the protests – the Alawites in particular must be quaking in their boots at the retribution that will likely follow when the Alawite Assads fall. This does not mean that the protests are not justified and no apologia for the Assads is intended. However, any interventionists should be prepared for an ethnic bloodbath and population transfer that will likely dwarf what happened in post-Saddam Iraq. An added complication is the absence (or lack of knowledge) of an alternative leadership that could replace the Assads. Finally, and to put it crudely, this is not America’s fight. As the United States ends a decade long commitment to the Iraqi blunder it makes no sense for it to be sucked into another invasion of a Baathist regime in support of a fractured, incoherent and leaderless opposition and reaping yet another bloody ethnic whirlwind. If Turkey (wouldn’t the Arab Syrians just love an occupation by their former imperialist overlord *snark*), Saudi Arabia (whose historic track record against well armed regimes is to talk loudly and let someone else do the fighting) or France (who ran out of bombs fighting Gaddafi’s weak Libyan military) want to take the lead, be my guest. Unlike (yet another chest thumping) Senator Rubio, I think it is time for America to roll back the role of global gendarme rather than continue on a course of unsustainable global overreach that will drive us into bankruptcy faster than Barack Obama’s mythical spending increases. President Obama please continue your work in keeping us out of the Syrian quagmire. The fall of the Pharaoh raises the question whether the Middle East tumult will subside, or if this is the beginning of an avalanche not seen since Eastern Europe in 1989. While it is easy to get carried away, regime change in Tunis and Cairo occurred because the men with the guns did not act against the protesters. As Iran showed a couple of years back, unfortunately that is not always true. When the generals obey their masters and when the grunts obey the generals, democratic hopes come to a bloody end. It is also still not clear whether Tunis and Cairo were soft coups, where the public face of the regime changed but little else did. However, some local despots do need to be more scared than others. On cue the days of rage have commenced in three of the most vulnerable autocracies in the middle east. Iran – When Egypt erupted, the mullahs hypocritically cheered the right of Egyptians to protest. They should have known that their restive masses were looking at Cairo and drawing encouragement. Now the embers of the Green Revolution are reigniting. The opposition leaders are already in preventive house arrest and the riot police are cracking skulls. Algeria – Algeria was the rare Arab country that held free elections in the early 1990s. When it appeared the Islamists won, the military quashed the results (taking their cues from the Burmese junta who made the similar error of not rigging their elections a couple of years before). The next few years saw a brutal and bloody civil war. Though violence died down the last few years, unrest has always simmered underneath. Now it has erupted. Bahrain – The Gulf monarchy’s presence in this list may seem unusual to people who do not follow the Middle East, but the Sunni monarchy ruling a 70% Shiite population has had periodic bouts of unrest. After promising to respect peaceful rallies, King Hamad bin Isa al-Khalifa has opted for bullets. Warning: Violent video below. The protests in all three countries already highlight one huge difference with Tunisia and Egypt. These autocracies are willing to spill blood. The men with guns and batons will have to refuse to take orders for these tyrants to fall or give way. The list above is also not exhaustive. Yemen, Jordan, Sudan and to a lesser extent Syria (where you have to frankly be foolhardy to publicly protest) have faced protests. Then there is the longest ruling autocrat in the region who has seen his fellow dictators on either side of his country fall. The recent cables leaked by Wikileaks revel how the 41 year regime of Muammar Gadaffi has been tarnished by his licentious progeny. Even Libya may be facing the unthinkable, public protests. It is very likely that no more dominoes will fall this go around, but the yearnings for freedom and respect on the Arab street will be harder to bottle up again. And if one can dream, if Egypt actually manages to create a constitutional democracy the clock will start running out for the remaining autocracies in the region. The 1990s saw the demise of assorted military juntas in Latin America. Even though the Chavezs and Ortegas are threatening democracy in the region, by and large military rule is passe in the region. Lets hope this decade sees similar change from the Maghreb to the Fertile Crescent, and beyond. As a final note, do notice how quiet the murderous thugs of Al-Qaeda have been at the sight of the Pharaoh being toppled without suicide bombers.